Branding is the life of a company — its heart and soul! At Graphic a la Design we believe successful design is built through genuine collaboration between our clients and our team. We will work alongside you from the initial contact through to job delivery. We will ask pertinent questions about your goals, potential and existing clients and competition; discuss with you, your deadlines and budget. We encourage you to read through the testimonials throughout this website, on Google Reviews and on our social media pages. These authentic messages are endorsements of Lori’s professionalism and commitment to her clients and their businesses’ success. 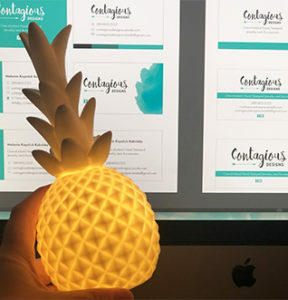 Over the years, Lori has accumulated many things “pineapple” including this little lamp her husband purchased for her. He thought of the idiom, “The light just goes off with creative people” — just like it does with Lori. View the list of services below and see how Lori can bring advantage and value to your company. Some samples of work can be seen on portfolio pages I, II, III, IV and V in the tabs above. Due to contractual restrictions with some of our corporate and trade clients, not all work is posted. Although we are not permitted to post on the Internet or through social media, we would be happy to show the portfolio items to you, in person. Please reach out! I couldn't sing the praises of Lori loud enough. A huge help getting my business off the ground. Great work, efficient in every aspect of the word and a truly amazing resource for branding/building your business. If I could give her 10 stars, I would. Thank you for everything Lori! We are always very impressed by Lori's creativity and attention to detail. Her progressive style is consistently fresh and evolving, keeping us one step ahead of our competition! Highly recommended! Lori's work is very professional and she is extremely efficient as well as being very personable. Her great communication and vision enables your vision to be met. She puts her everything into her work and wants you to be pleased with the outcome. Graphic a la Design can build or revive your business. With the three pillars of sustainability in mind: people, planet and profit, we collaborate with you, discussing your target market and your competition. Once we have created your brand strategy and brand identity, we will then nail out your brand guidelines, your go-to-guide! • Apparel, pens, mugs, water bottles, etc. A part of your brand identity, a well-designed logo is transferable to all print and digital media applications and should be used in all communications — paper and on-line. • Specification and use guide (visit our Facebook page for examples) containing full colour pallet (Pantone, CMYK, RGB, HTML and greyscale colour conversions), font names and weights, file type explanation and the do’s and don’t of your logo. For brand consistency, this package should be forwarded to anyone reproducing your logo. The social media landscape is continually progressing and evolving. We can support and integrate social media into your business or brand by developing a strategy, assisting with content creation and page development. An affordable way to draw traffic to your business. We are a one stop shop for domains and websites. We can build and maintain your site, or build your site then train you and your staff to maintain it. Our responsive websites (desktop, mobile and tablet viewable) are professionally designed to align with your industry standards. All come with: Stock photos (backgrounds, accent photos, design elements, etc. ), photo correction/editing of client supplied photos (unlimited); supplied text structured in Canadian Press Stylebook format (basic copy editing included); social media integration; SEO (image compressing, Alt tags on images, keywords, Google Indexing, Analytics); and more! All websites come with 30 minutes per month of edits for the term, which is perfect for monthly specials, product updates or holiday best wishes. Our experts offer copywriting, editing and translation services. We have extensive knowledge of multi-sector copy stylebooks, ensuring the production of clear, high quality written material that is consistent with the sector of your business and contemporary English. We are experienced at formatting and designing accessible print and online communications and documents using Barrier Free Accessible Design, Design Best Practices, Clear Print Guidelines, Accessibility for Ontarians with Disabilities Act (AODA) and Web Content Accessibility Guidelines (WCAG). We offer Spanish, French and English translation services for your next bilingual or trilingual print or online document. Using grids and font couplings, we add precise contrast and visual hierarchy to draw in your audience. From detailed design of high-end magazines, corporate brochures and catalogues, we have the over two decades of experience of creating stunning, effective and accessible print communications. It is estimated the average consumer spends less than a second scanning shelves, and in that time, will make a decision on whether or not to purchase. The proper packaging will sell your product while keeping it safe and protected. Whether you require traditional portrait photography or family photos outdoors at your favourite location, we will capture moments that can be shared with generations. We also offer clients custom, on-their-premise product photography, as well as the cost efficient and time benefit of stock photos. You can be rest assured, your files are safe. Our computer software and hardware are up to date. We secure all client files, backing-up every three hours. Payment is accepted by cash, cheque, direct deposit, wire or e-transfer. A 50% deposit is required prior to first proof and balance is due upon completion of the project. HST will be added to all invoices. Click Here to read Graphic a la Design’s terms and conditions. We can direct you towards information about the Marrakesh Treaty, copyright, intellectual property, ownership and record searches.